Since I have been harvesting so many cucumbers, I decided I needed to start processing them other than eating them raw in salads. 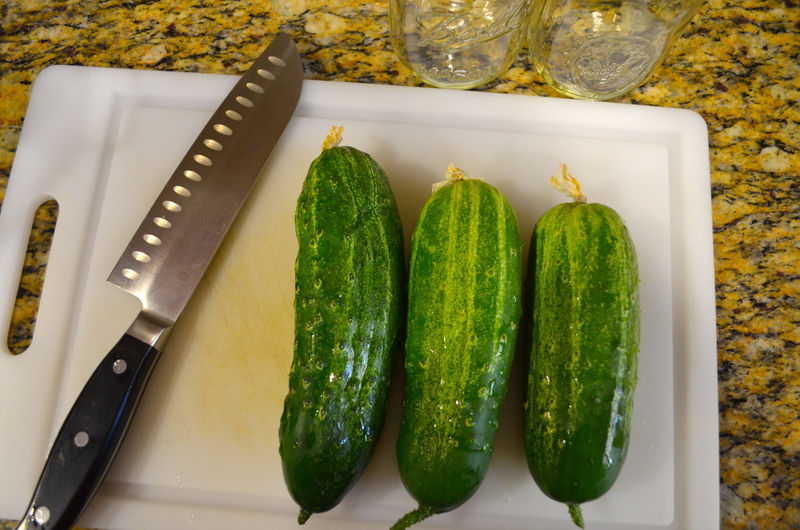 My cucumbers are perfectly straight so great for making pickles! Trellising your cucumbers allows your fruit to hang down letting gravity help you grow straight cucumbers. 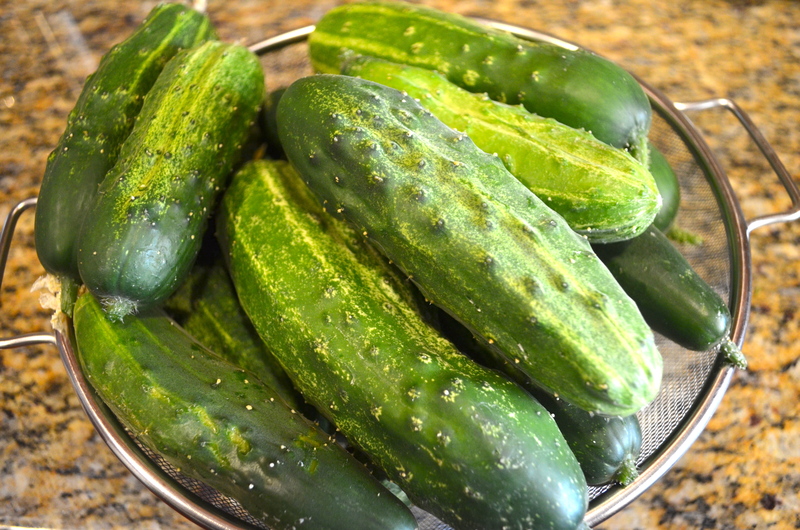 Plus cucumbers are great climbers and trellising prevents the fruit from rotting on the ground. I used Food in Jar’s Refrigerator Dill Pickles but added and subtracted to fit my tastes. I wanted to make a small batch and I didn’t feel like canning on a day when our projected high is going to be 100°. Plus a girl can only eat so many pickles! First I washed and then cut off the ends of the cucumbers. I cut each cucumber into 8 wedges. One cucumber was a little too long so I had to trim off the ends a bit to have it fit into my 16 oz. canning jars. I wish I had used my wide mouth jars so I could have fit the cucumbers in a little better. 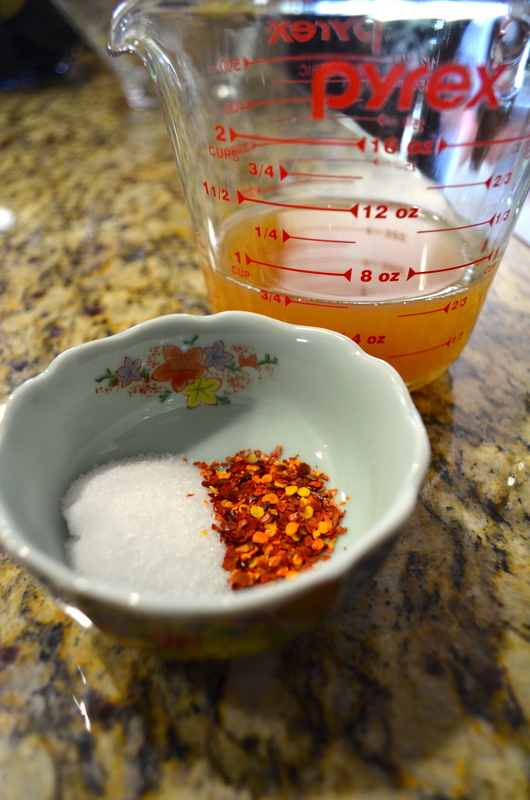 I added two cloves of garlic to each jar and a 1/2 teaspoon of crushed red pepper as well. I measured 3/4 cups of apple cider vinegar, 3/4 cups of filtered water and 2 teaspoons of pickling salt which I brought to a boil on the stove. When the brine came to a boil, I transferred it to a measuring cup and poured it into the jars leaving about a 1/4 inch gap on top. I popped the lids on and let them cool on the counter before putting them in the fridge. I can’t wait to eat these in a day or two! I have a whole month to eat them before they go bad but I have a feeling they wont last that long! 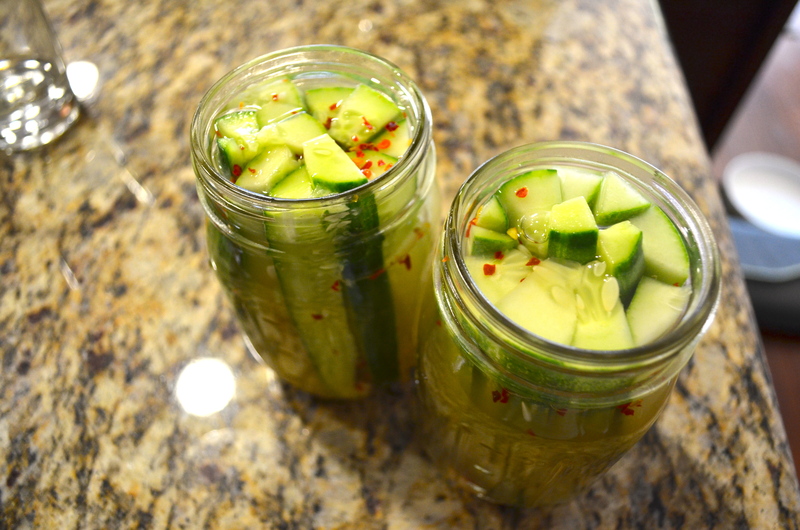 I foresee many batches of these pickles during the summer months. 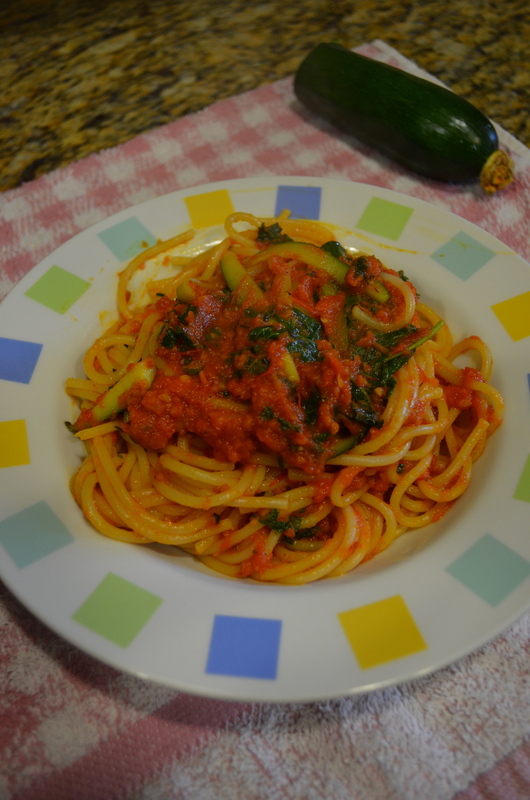 The whole process, including clean up, took me about 15 minutes so this is a super easy recipe to do. If I end up having a glut of cucumbers and more time on my hands I am going to try canning them too! 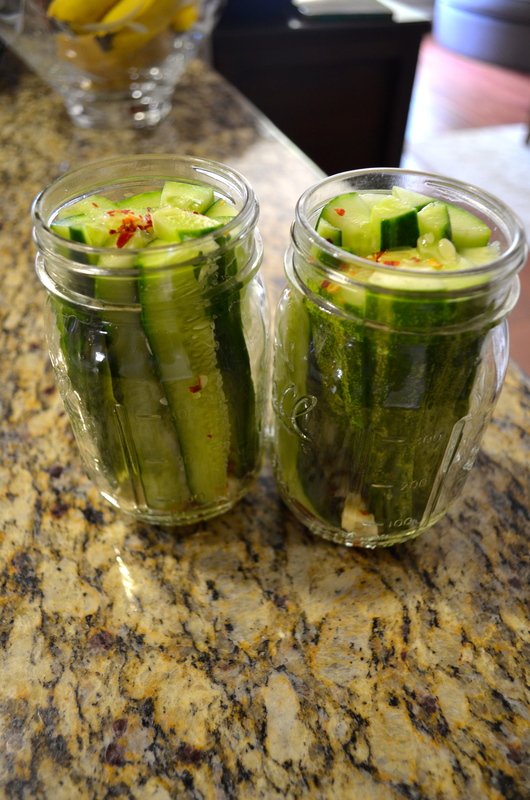 Tags: cucumbers, pickling, preserving, recipe | Permalink. Well you started your tomatoes early from seed, sheltered them through the cold months under grow lights, transplanted them with your best homemade compost, mulched them and now you just have to wait to see which problems will arise. Tomatoes are so easy to grow but there are lots of problems that can occur which quickly turns my “I can’t wait to bite into my first homegrown tomato” moment into “Ugh, what if I get horn worms!” “Ugh bottom end rot!” “Curly virus!” “Nutrient deficiency!” “Under watering” “Over watering!” The list of things that can go wrong keeps me up at night. 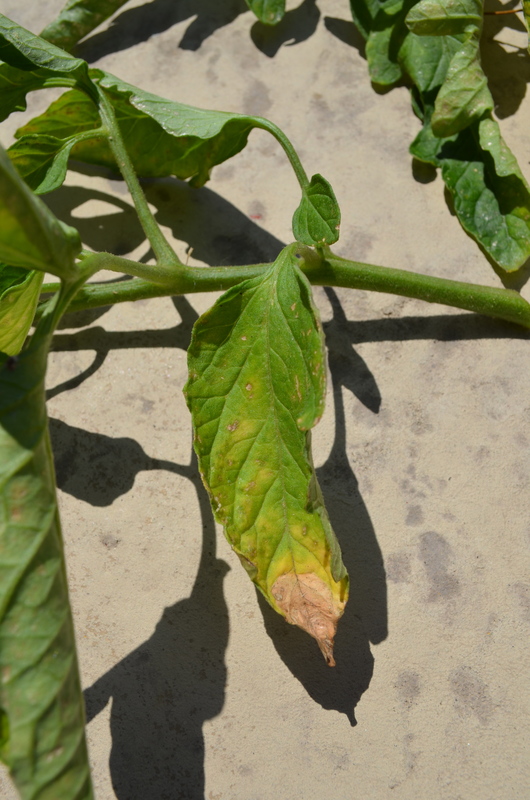 So I was reading some blogs the other day… minding my own business… not even worried about my tomatoes… yet. 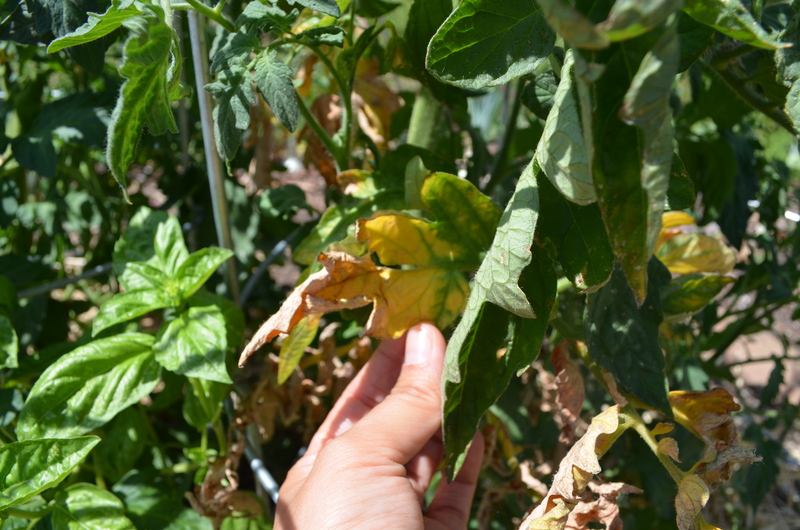 Until I came across this blog post from The Demo Garden Blog entitled “Watch for Disease in your Garden” with a picture of a tomato infected with early blight. Then I remember earlier in the day, I was talking to my tomato plants and I noticed the Striped German kind of had some yellowing going on (yes, that is a technical gardening term). I didn’t really think about it. Not until I read that post. Argh! Why do I read gardening blogs?? 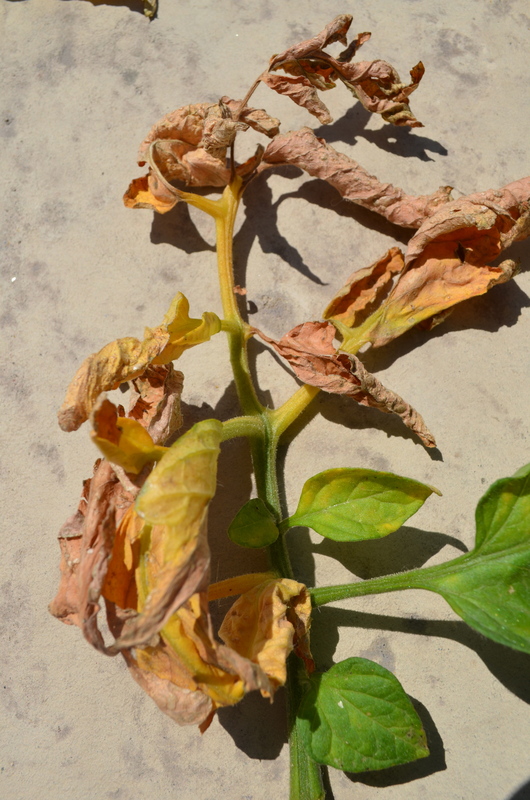 I was so ignorantly blissful not knowing the “yellowing going on” in my garden was a problem. Well I decided to tackle my Septoria Leaf Spot or Early Blight problem, which really isn’t much of a problem. I read the recommendations over at the Demo Garden Blog and decided to cut back all the infected leaves. It really was contained to the lower portion of the plant. I planted my Striped German right next to my Persimmon so I took a closer look at the Persimmon plant to make sure it hadn’t spread from plant to plant. Luckily, the Persimmon plant looks unaffected. 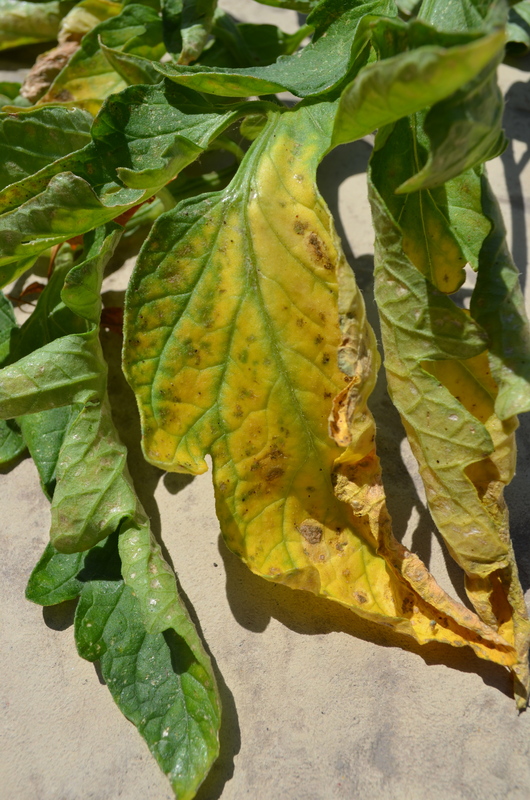 I’m not going to use fungicides on my plants and since it is has been in the mid 90s this week (and only going to get warmer in the summer months), I am fairly confident this wont be a long-term problem. Also I am going to be more careful when I water not to splash up water onto the bottom leaves which should help as well. I am going to do more pruning of my tomatoes this year to encourage more air flow. Thanks Demo Garden Blog for enlightening me! 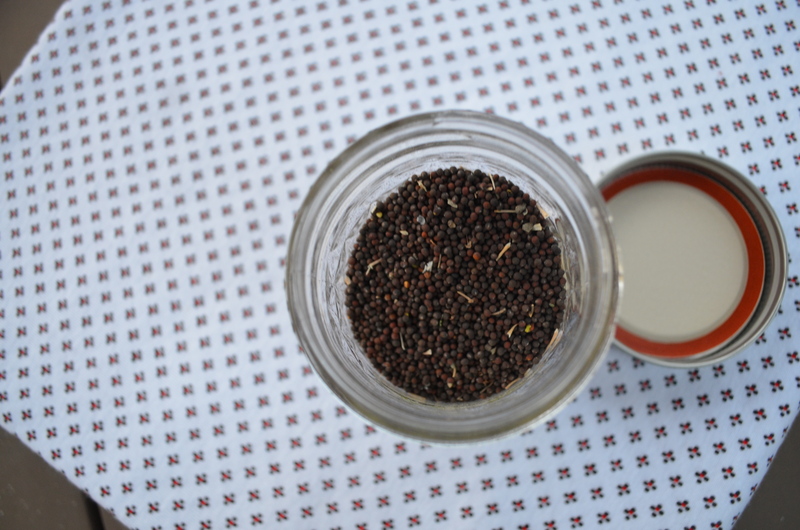 Wow, lots of saving seed posts lately! It seems like lately every time I go into my garden there is another seed waiting to be saved. Yesterday I was working in my front yard raised bed and I noticed that my calendula flowers looked rather tired and slumped over. 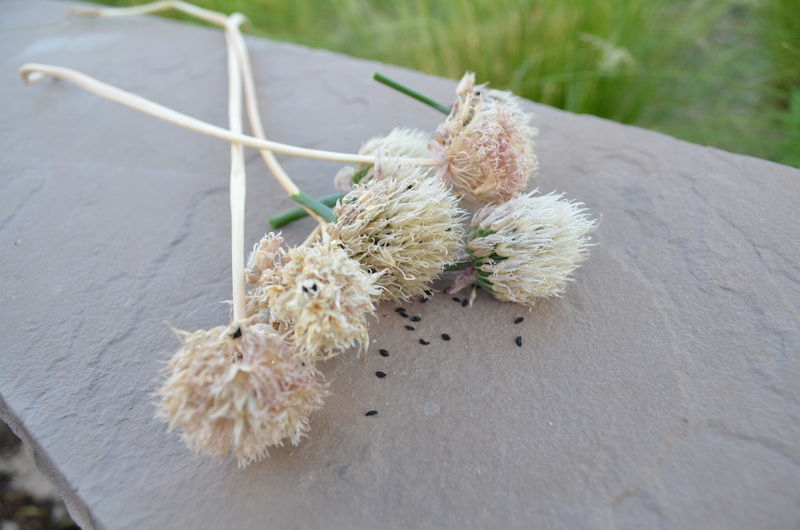 I looked closer and noticed that some of the flower heads were dry and the seeds ready to be harvested. This variety of calendula was called Pink Surprise… but the pink never surprised me. The flowers were all orange so I am not sure where the pink came into play. The seeds are super easy to collect. This is my first time growing calendula and my first time saving the seed. It was pretty self explanatory! 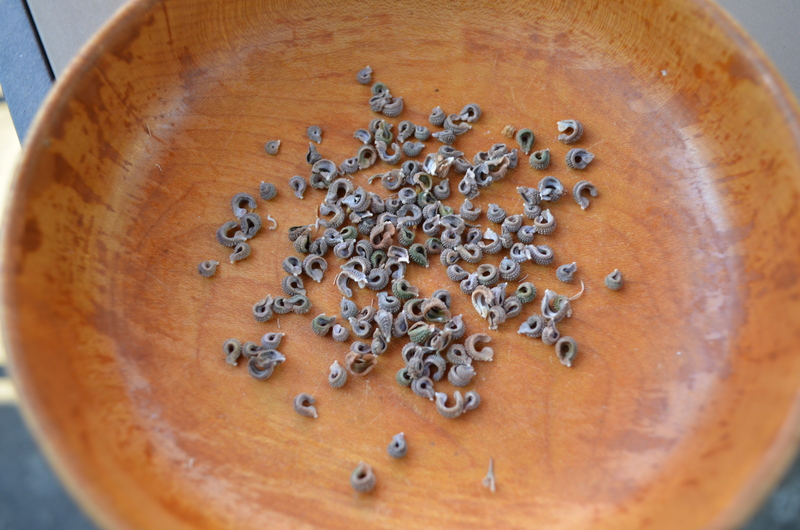 I just picked off the flower heads and broke them apart revealing the seeds inside. 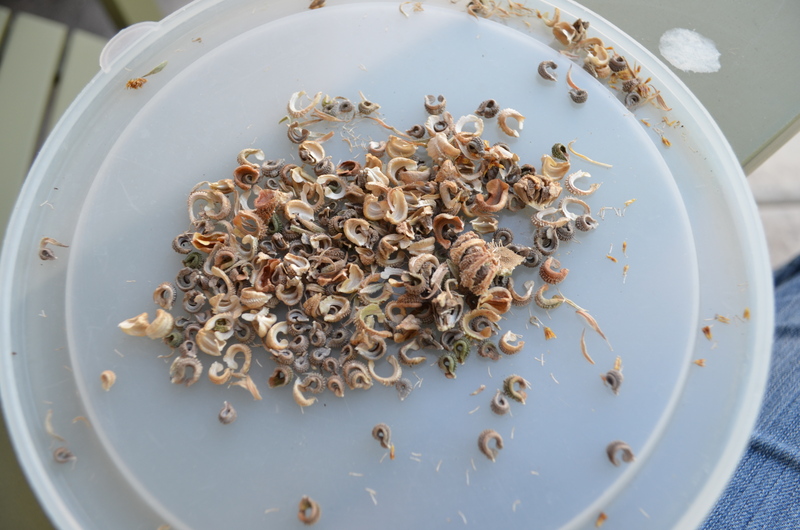 The seeds were a brownish gray and are curled up. 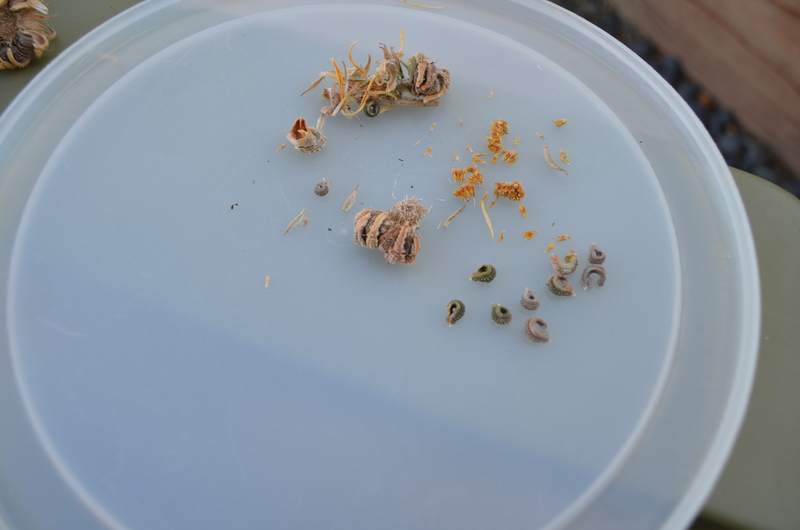 I think the calendula seed looks like mini armadillos curled up. They even have spiny backs! Calendula is self seeding which means next year I probably will have it pop up on its own again. This is great because I really tend to focus on edibles first and flowers second (or not at all!). I am trying to make an effort to integrate more flowers into my garden and this will definitely be a gardening goal for next year. However I am saving seed so that I can either give it away or plant it myself if the calendula fails to self seed. 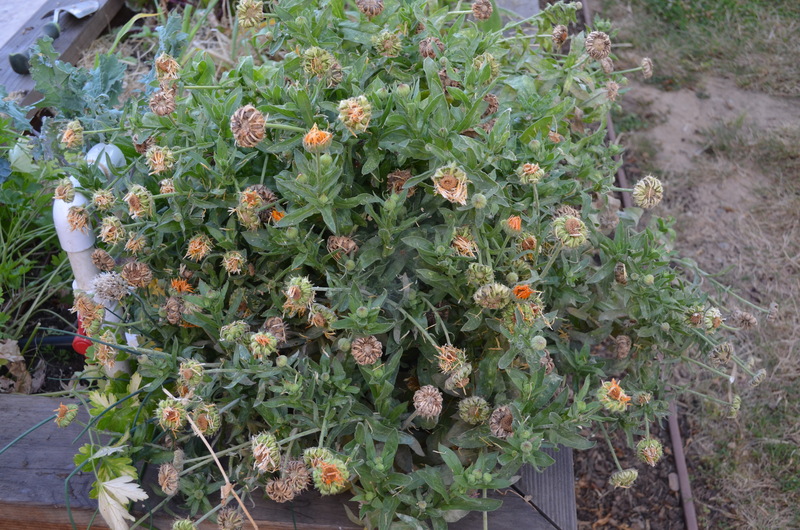 Tags: calendula, flowers, seed saving, seeds | Permalink. 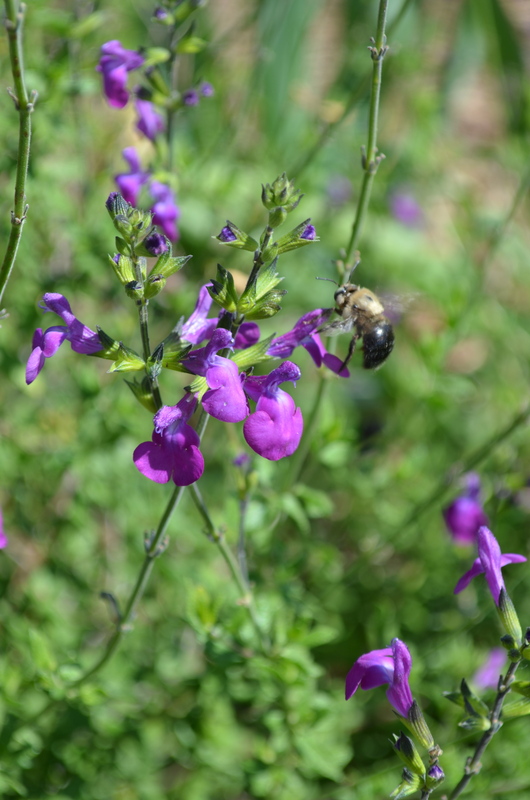 With lavender and my salvias in full bloom, I’ve observed so many more bees in action. The bees have definitely communicated to one another that my garden is the place to be! Last year our plants were fresh in the ground so I would only witness the occasional bee or two. I’m not sure if our plants were new to the neighborhood so not many came to my garden or the lack of bees was a sign of colony collapse. Of course this is only my second year of gardening in Sacramento so I don’t have much evidence to go off of but this year there are so many more bees in my garden. Not only are there more honey bees but there are many different varieties of bumble bees. I’ve even seen some bees that I have never seen before. I take all of this as a good sign that my garden is healthy and thriving. The lavender and salvias tend to be the biggest attractor for the bees which will mean I will have pollinators when my beans and squashes start to bloom. Plus an added benefit is that these plants are super drought hardy. 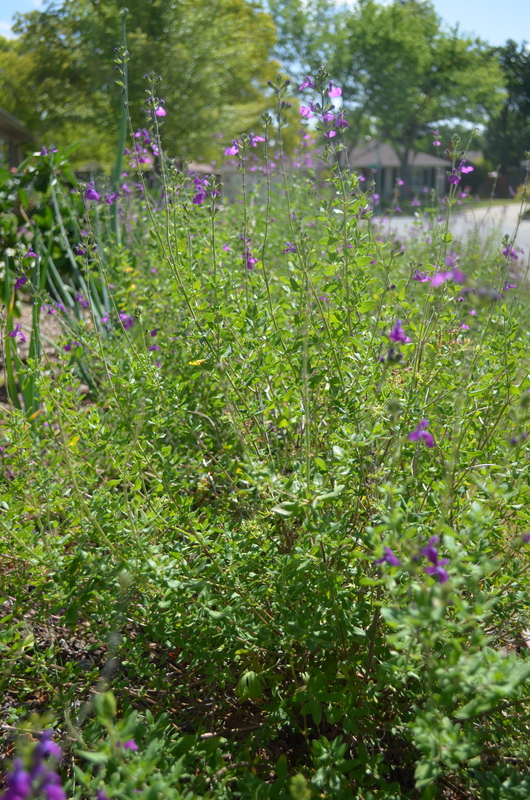 They have thrived on very little water and you wouldn’t know California is having a drought looking at these plants! Tags: lavender, salvias | Permalink. 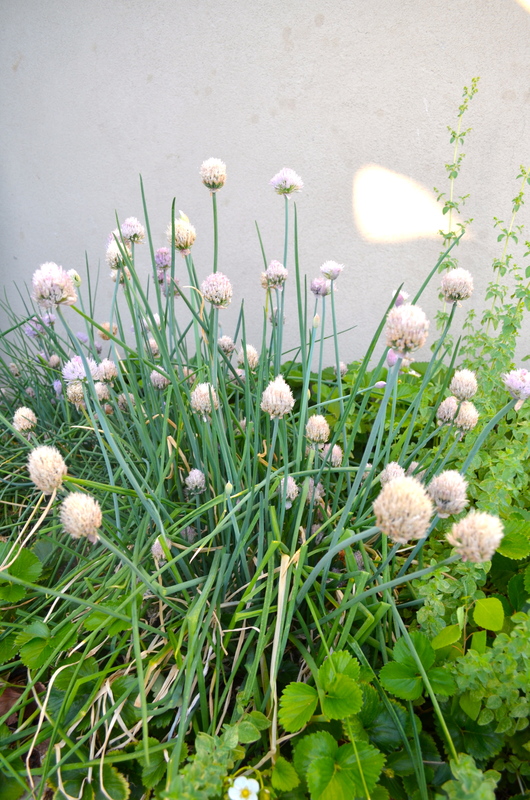 I planted these garlic chives last year and they have been doing great in my herb bed. They are getting a bit crowded so I may have to split them at some point. 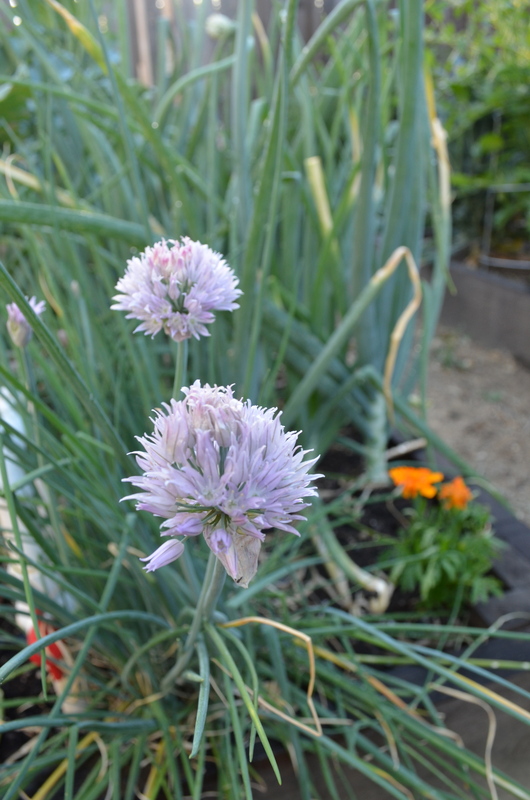 I’ve never reproduced garlic chives by the division of clump method but it is suppose to help the plant live longer and more vigorously. Plus you get two plants for one! As you can see, some of the flower heads have dried out and the seeds are threatening to burst out. 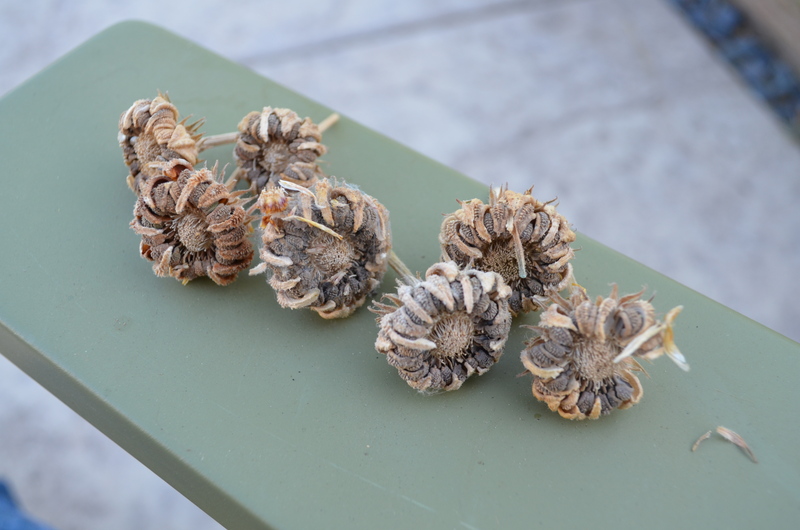 I picked a few of the flower heads that were dry to save the seed. I noticed on the flower heads where the stem had completely dried there were not as many seeds compared with flowers that were mostly dry but the stems were still green. I wasn’t sure if I had to wait for the stems to be completely dry but it seems that a lot of seeds popped out already. Maybe I need to tie a bag around the flowers since my timing wasn’t perfect. 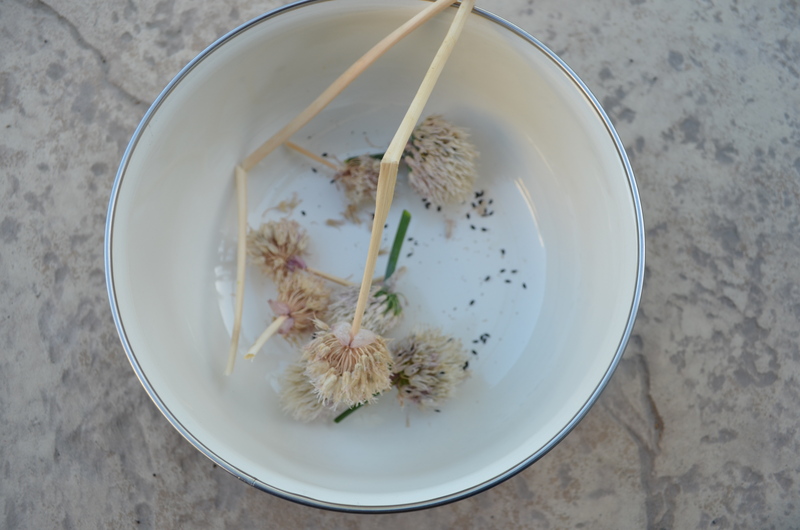 After I pinched off the flowers, I put them into a bowl. 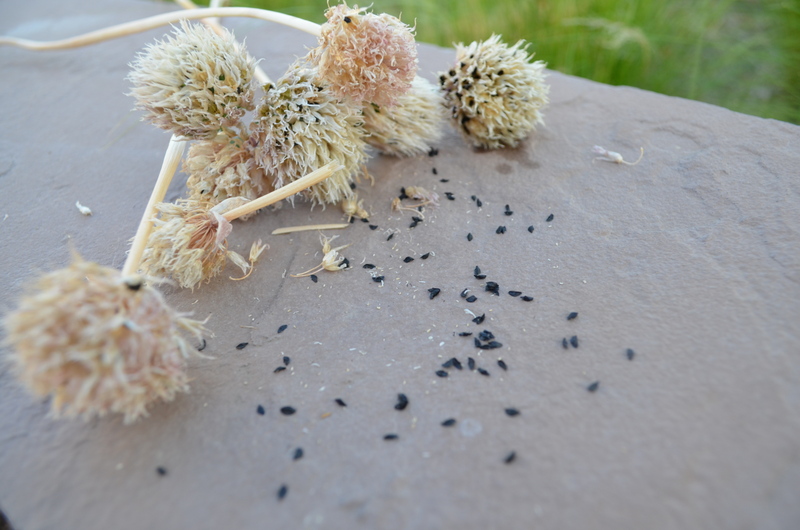 Some of the seed easily popped out and some I had to rub the flowers between my fingers to release the seeds. 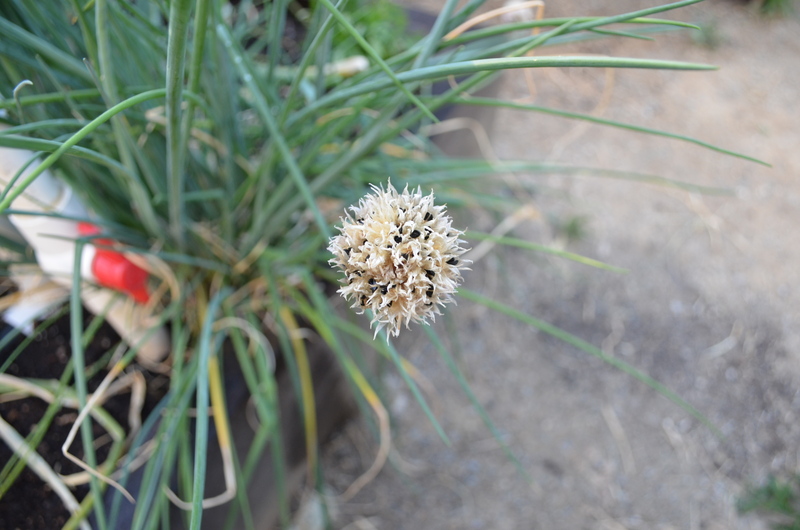 Tags: garlic chives, seed saving, seeds | Permalink. I went into the garden this evening to do a few things here and there… add a bucket of compost in some of the beds here… train up my cucumber on the trellis over there. Sometimes there are things in the garden that you just keep putting off. You really should get to it but you just can’t get around to it. 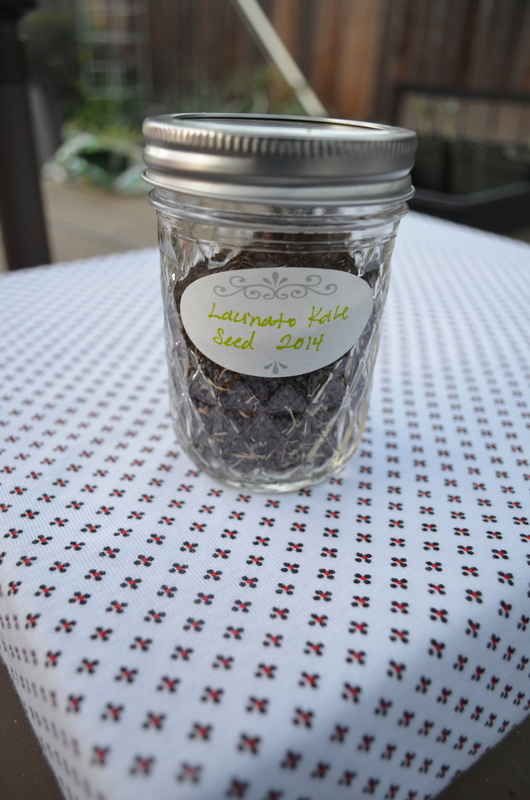 Well awhile ago I posted about saving my Lacinato Kale seed but the thing is I only did a little seed saving and I left the monster plant with thousands of seeds in the garden. The other day when I was in the garden I noticed small seeds all over my path so I knew I needed to tackle the rest of this task. Well today was the day and after an hour in the garden the monster is gone! First I started by pulling up the plant. 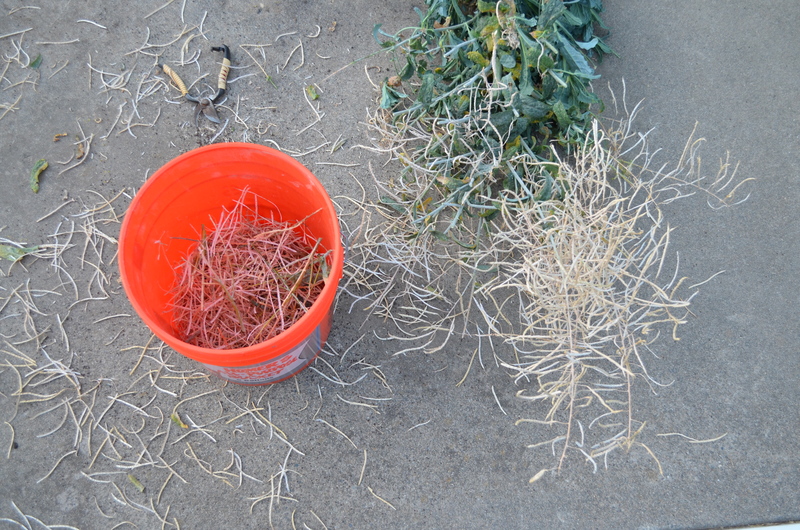 Then I cut smaller branches off so it would fit into a 5 gallon bucket. 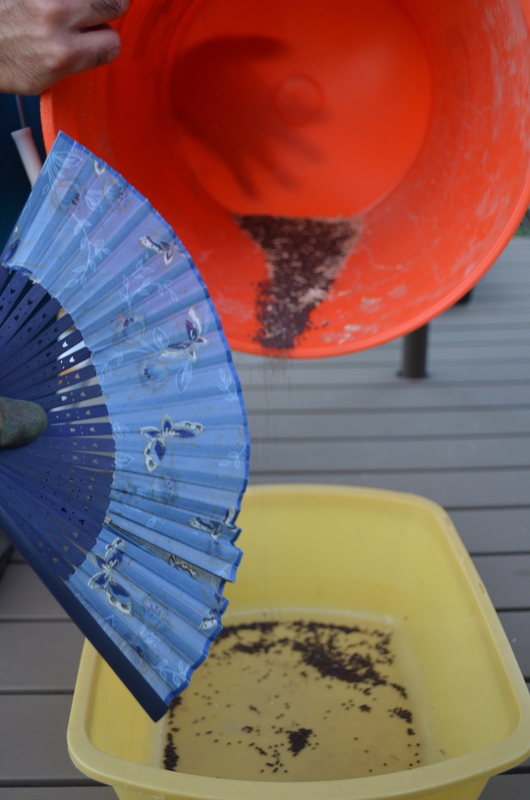 In the bucket I scrunched up the seed pods with my hands, releasing the seeds into the bottom of the bucket. 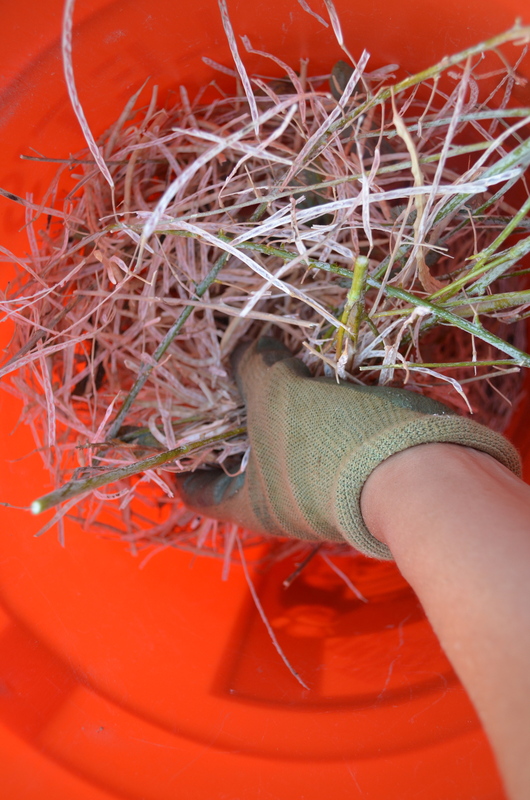 I took the bigger pieces of seed pods and put those into the compost. Then I grabbed a small pan and my compost sifter. 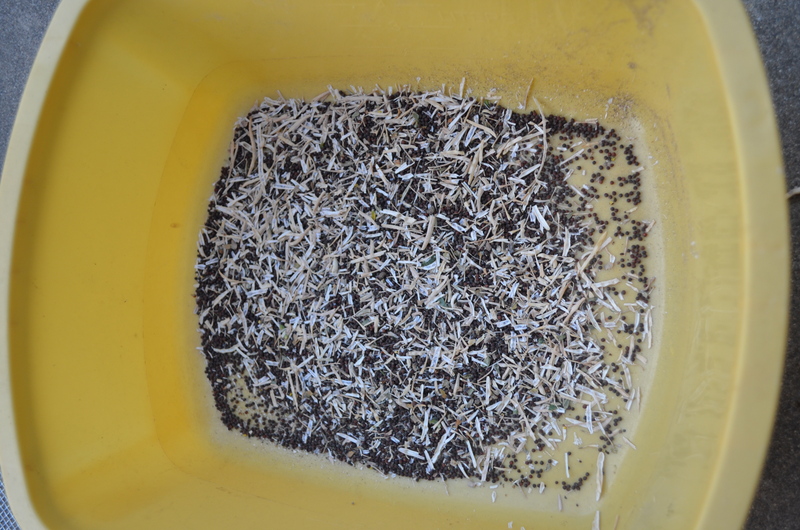 The first pass through the compost sifter really helped separate the bigger remnants of the seed pods but the holes in the compost sifter were still too large. 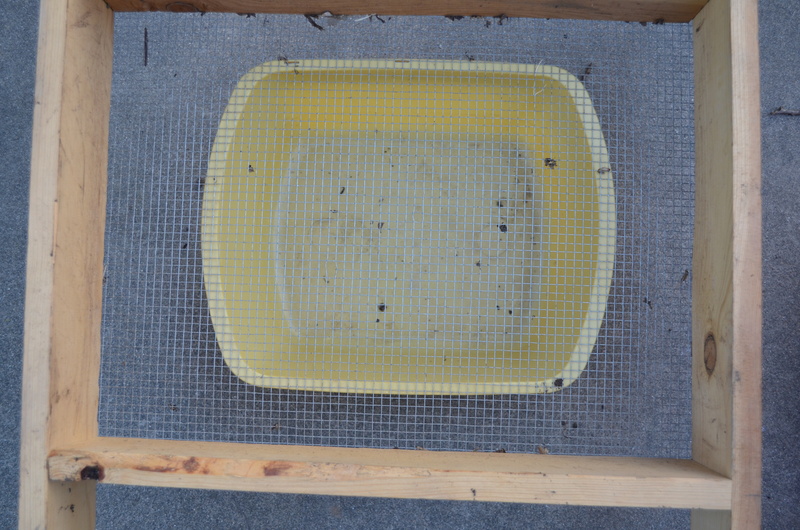 I passed the seeds through the compost sifter one more time before using a mesh with smaller holes. 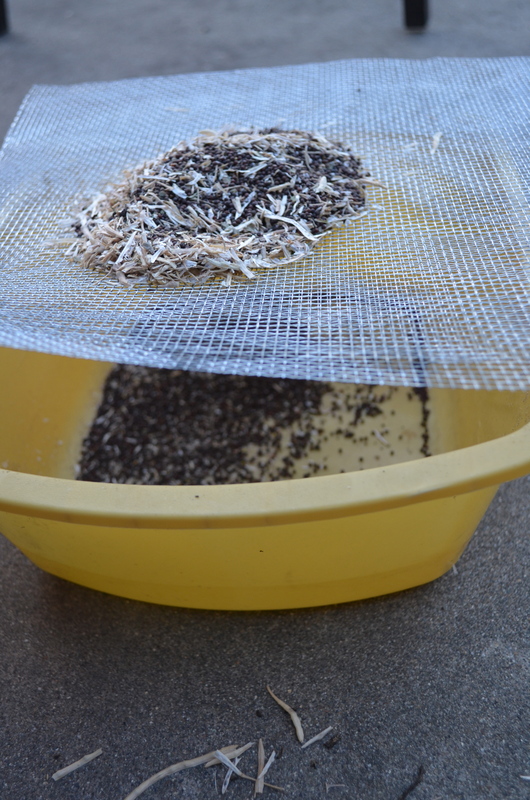 I then folded my mesh in half to make even smaller holes for the seeds to pass. 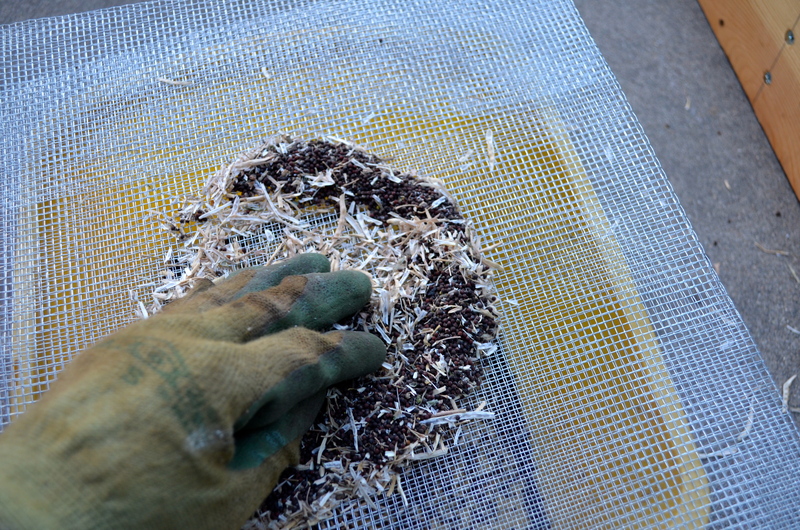 I hope I can make some screens in the future to help me with the winnowing process! 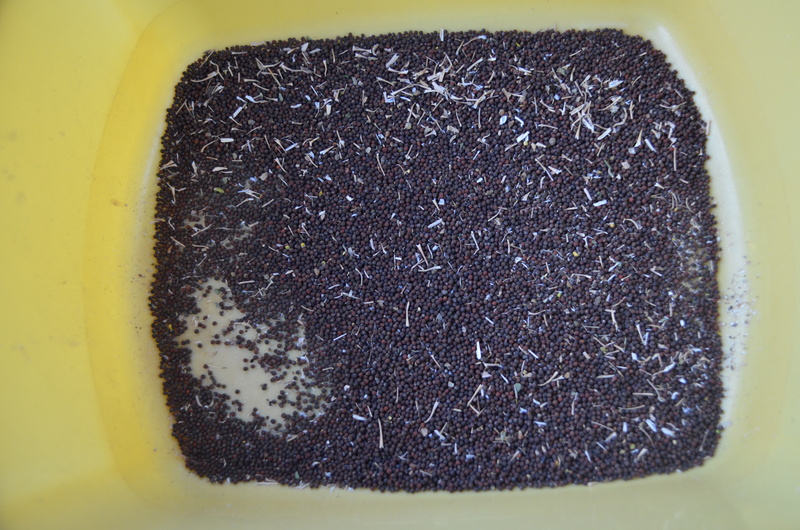 Almost all the bigger pieces were sifted out of the seeds. 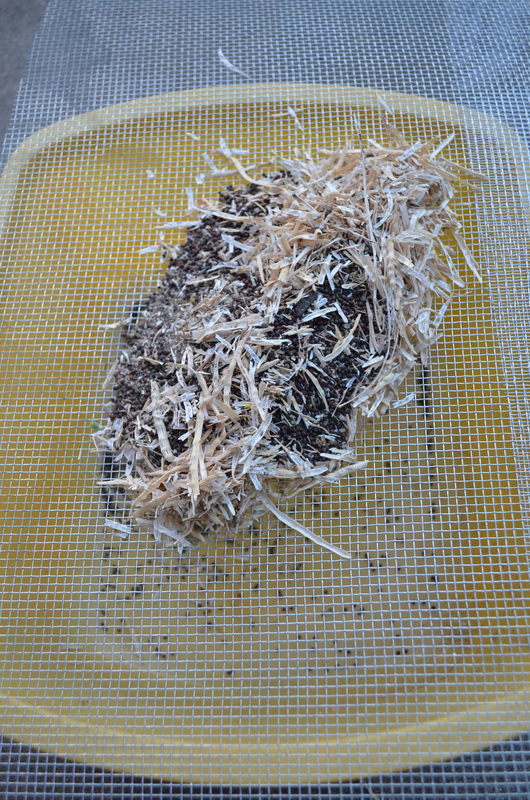 The rest of the debris I separated by a combination of blowing, using a fan and gravity to separate the seeds and chaff. We don’t have electric fan which would have made this job much easier so we used the low tech method. I wasn’t able to get all of the debris away from the seeds but it still was pretty good. Look at how many seeds I saved! That is a half pint jam jar almost full of seeds! I have so many that I will have to give a lot away! 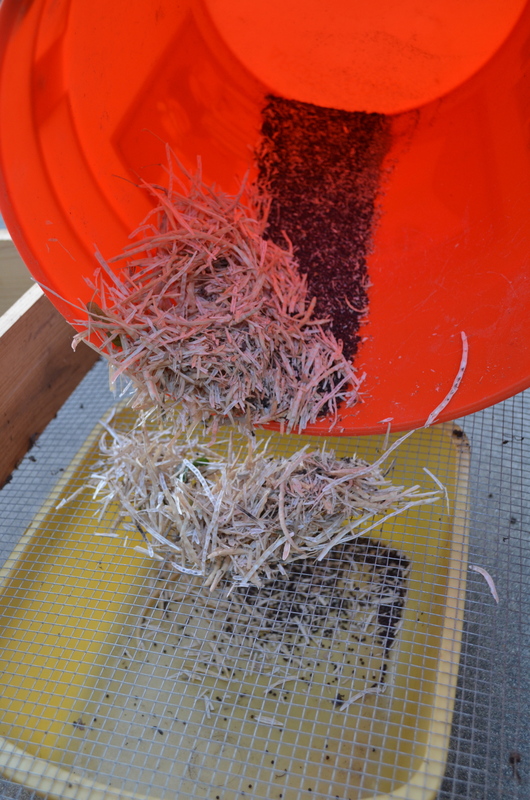 Tags: compost sifter, kale, seed saving, seeds | Permalink.